Durobrivae was a Roman fortified garrison town located at Water Newton in the county of Cambridgeshire, where Ermine Street crossed the River Nene. More generally, it was in the territory of the Corieltauvi in a region of villas and commercial potteries. The name is Celtic in origin, and essentially means “fort bridge”. During the Iron age Britain was divided into distinct tribal areas. The area lay between the Catuvellauni to the south and the Corieltauvi to the north, with the Iceni to the east. The origin of Durobrivae is said to have been as a vicus attached to a “pre-Flavian” fort, established about half a kilometre to the east of modern Water Newton, between th 43 AD and 69 AD. Its first historical mention is in the late 2nd century. Archaeology of the Roman period shows that Durobrivae was then the production centre for a fine tableware known as Nene Valley Colour Coated Ware, from the 2nd century to the 4th. In Anglo saxon times, local settlement came to centre on Medeshamstede, now known as Peterborough. The Water Newton Treasure is a hoard of fourth-century Roman silver, discovered near the Roman town of Durobrivae at Water Newton. The hoard consisted of 27 silver items and one small gold plaque. Because of inscriptions found on some of the pieces in the collection it has been suggested that they may have been used in a local church, and they therefore comprise the earliest probable group of Christian liturgical silver yet found in the Roman Empire. The hoard was discovered during ploughing in February 1975; several items were damaged by the plough. It was probably buried by an inhabitant of the nearby Roman fortified garrison town of Durobrivae. There are nine silver vessels, and the remainder of the items are votive tokens engraved and embossed with the labarum (the chi-rho cross), mostly of triangular shape. The larger items include jugs, bowls, dishes, a strainer, and an unengraved standing two-handled cup of the form (cantharus) later used as chalices. Due to the importance of this find, it is now in the British Museum, with replicas at Peterborough Museum. The rebuilt north aisle has a mid 14th-century twolight window reset in the east wall, and two others and a blocked doorway in the north wall. The western end of this aisle is of late 14th-century date, is shut off from the rest by a cross wall, and used as a churchkeeper’s storeroom; the west and north walls each have a narrow window, and near the top of the former is a small trefoiled opening, now blocked, which once opened into a space between the roof and a lower ceiling, possibly used as a dove-house for the rector’s pigeons. The early 14th-century tower has no tower arch, but a plain doorway, of c. 1400, opens into the church, and above it is a rough relieving arch; still higher up is a square-headed opening made up of 12th-century stones. 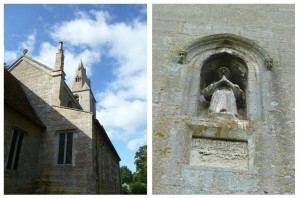 The two side walls have each a reset 13thcentury lancet, and the west wall has a small niche containing the figure of a man (the head modern) and below it a sunk panel inscribed ‘vovs ke par issi passez pvr le alme [th]omas pvrdev priez,’ which is supposed to commemorate the builder of the tower. The belfry windows are two-lights, those on the north and east enclosed in a semicircular outer arch, and the others under pointed arches, but the outer orders are all decorated with the chevron ornament, and they appear to be 12th-century windows altered and reset in the 14th century. The tower, which has no buttress, has a very bold plinth, and is finished with a cornice of notch-heads and surmounted by a rather short octagonal broach spire having two tiers of lights; the upper part has been rebuilt with new stone and the old stones have been built into the churchyard walls. The height to the top of the spire is 95 ft.; and the vane has the initials ‘J.C. 1803,’ for John Compton. The stairs are in the south-east angle. There are the following monuments: in the chancel, to Caroline Knipe, d. 1832; Harriot Jane Knipe, d. 1833, and William Knipe, infant, d. 1824; Harriot wife of the Rev. Randolph Richard Knipe, d. 1840; Frances Knipe, d. 1844; Frances wife of Edward Samuel Knipe, d. 1844; the Rev. Randolph Richard Knipe, Rector, d. 1859; the Rev. Randolph Knipe, Rector, d. 1873, and Elizabeth his widow, d. 1908; floor slabs to John Harbottill, of Baston, Lincs, d. 1646/7; the Rev. Jeffery Hawkins, Rector, d. ; Mary wife of the Rev. Jeffery Hawkins, Rector, d. 1709; [Hannah] daughter of the Rev. Jeffery Hawkins, Rector, d. 1715; the Rev. Robert Fuller, Rector, d. 1735, and Jane (Fuller) his widow, d. 1757; Original Jackson, d. 1771; Jane daughter and heiress of the Rev. Robert Fuller and Jane his wife, d. 1805; the Rev. 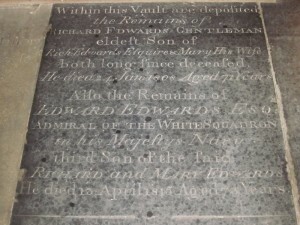 Edward Kerriche, Rector, d. 1807; Richard Edwards, eldest son of Richard and Mary Edwards, d. 1808, and Edward Edwards, Admiral of the White Squadron, their second son, d. 1815; Mary wife of Samuel Edwards, their fourth son, d. 1816; and glass windows to Henry Edwards of King’s Lynn, d. 1868; Samuel Edwards of Lewisham, Kent, d. 1882; and Elizabeth widow of the Rev. Randolph Knipe, Rector, d. 1908. 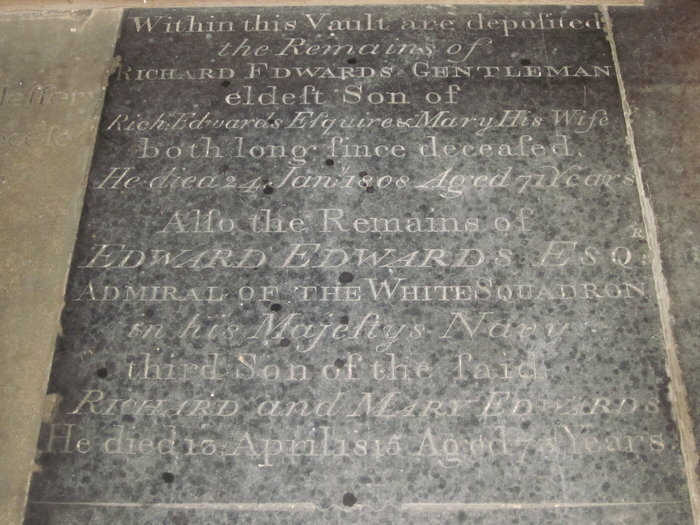 In the nave, floor slab to John Compton, d. 1815, and Elizabeth his wife, d. 1831. In the north aisle to William C. Woodhouse, brother of the Rector, d. 1892; Charles James Sampson, d. 1916; Hugh Delane Sampson, died of wounds received in France, 1917; and floor slabs to the Rev. John Old, Rector [d. 1753], and [Jane] his widow, d. , and [Elizabeth] (fn. 38) daughter, d. 1767; Easter Fuller, d. 1769; Jane daughter of Richard Edwards, d. 1780, William son of Richard and Mary Edwards, d. 1784, and Samuel another son, d. 1816; Mary (Fuller) wife of Richard Edwards, d. 1801. In the south aisle glass window to Caroline Maria Woodhouse [mother of the Rector], d. 1876; and C.B.E. 1887. The church plate consists of (fn. 39) a silver cup which looks as if part of the base is missing, inscribed ‘Water Newton’ and hall-marked for 1636–7; a silver cover-paten which does not fit the cup, inscribed in script, except the two capital letters, ‘Water Newton,’ 17th century, but no hall-mark; a small silver bread box inscribed ‘I.M. – – – E.L.R. 1918,’ hall-marked for 1909–10. 36 The re-used materials seem to suggest an earlier tower, but there is, otherwise, no indication of it. 37 As late as 1868, the nave had a low-pitched roof of the same date as the clearstory, and covered with lead (F. A. Paley, Twenty Churches near Peterborough, p. 104; W. D. Sweeting, Parish Churches in and around Peterborough, p. 168). 38 This and the five preceding items in square brackets are from the Transcripts of the parish register (Rec. Archd. Hunt. no. 115). 39 In 1709 there were ‘a silver cup without inscription, worth about £3’ and a pewter flagon. In 1724 there was also a pewter plate, but this is not mentioned in 1763 (Rec. Archd. Hunt. no. 232, Terriers). 40 Rot. Hund. (Rec. Com. ), ii, 648; Rot. Rob. Grosseteste (Cant. and York Soc. ), 290, 293; Linc. Episc. Reg. Time of Bp. Cooper (Cant. and York Soc. ), 69, 70; Cambs and Hunts Arch. Soc. Trans. iii, 271–72. 41 Rot. Hund. (Rec. Com. ), ii, 648. 42 Pope Nich. Tax. (Rec. Com. ), 36; Feud. Aids, ii, 480. 43 Valor Eccles. (Rec. Com. ), iv, 268. 44 Chan. Proc. (Ser. ii), bdle. 229, no. 16. We have all heard of the story of Pandora’s box but there is another story associated withanother vessel with the name Pandora. HMS Pandora was the Royal Navy ship captained by Edward Edwards, a resident of Water Newton, which was sent to the South seas to capture the mutineers from The Bounty. The mission to recover the Bounty and the mutineers was not wholly successful. whilst a number of mutineers and crew of The Bounty were recovered the ship itself was not found and the Pandora sank, having collided with The Great Barrier reef during the return passage to England. The sinking of the Pandora resulted in the drowning of 31 crew and 4 bounty mutineers. the survivors made their way in lifeboats to Timor and then to England. Captain Edwards was court martialled for the sinking of the Pandora and, whilst being cleared of any wrong doing, was never given another sea command, instead filling the purpose of a recruiting officer in Hull .In 1809 he was promoted to the position of Vice admiral (on half pay) and eventually retired to his native Water Newton, having been given the honorary title of Admiral of the White.